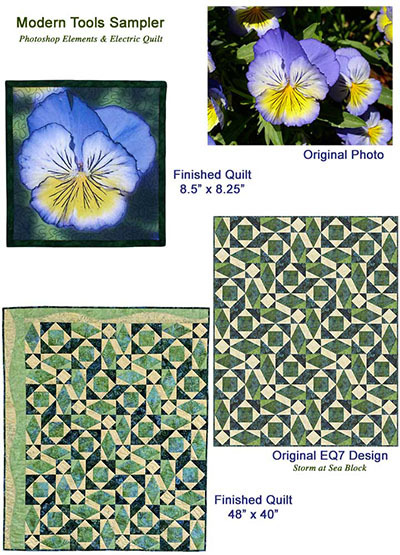 Try Photoshop Elements and Electric Quilt before you buy! Memory Quilts, Art Quilts and more…. Learn how to transform photos or fabric scans into a custom background or art quilt, and how to prepare photos for printing. Topics include, but are not limited to: Scanning Photos, copyright issues, Fabric & Printer choices for best results of printing on fabric, plus info on using print-on-demand services like Spoonflower.com, Editing Photos – e.g. fixing red eye, lighting, cropping, and Filters & Effects. A trial version of Electric Quilt 7 can be loaded in class. Photoshop Elements is available as a 30 day free trial from Adobe.com (click here to download), please download and install prior to class. Version 15 is the latest version which we will be using in class. Note to Windows XP users: Photoshop Elements 15 does not run on Windows XP. If you plan to bring a laptop still running this operating system and want to use a trial version of Photoshop Elements, please contact Jennifer prior to class. She has CD's with version 12 that can be loaded, so plan to arrive a little early. Copyright © 2000-2017 [Jennifer Rapacki]. All rights reserved.